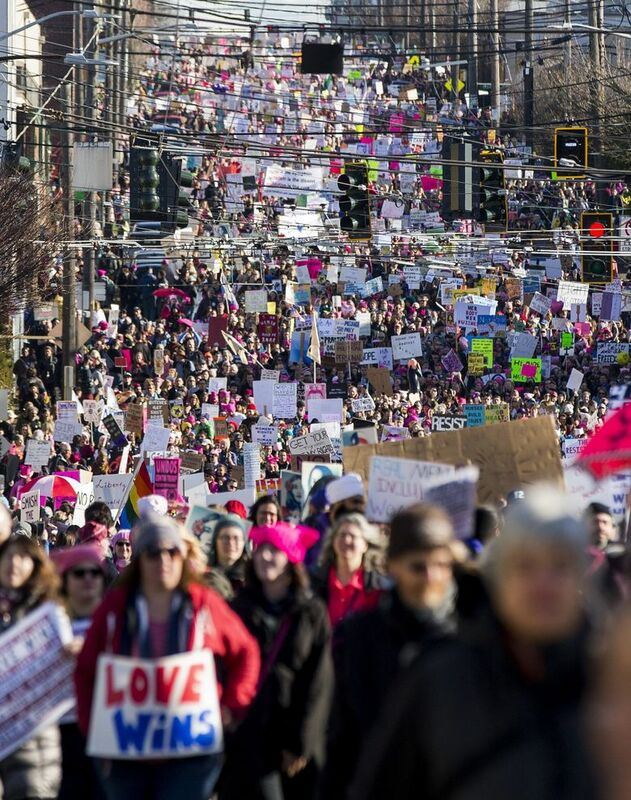 The Womxn’s March in Seattle last Saturday brought huge crowds through the neighborhood, sharply cutting sales on what ordinarily is a big shopping day before Lunar New Year. Before the Womxn’s March in Seattle last Saturday, some businesses and community members in Chinatown International District were concerned that the march could disrupt sales on what is typically the biggest shopping day of the year for some of the neighborhood’s stores. “It was a big hit for us,” said Leeching Tran, vice president of Viet-Wah Supermarket, which is located on Jackson Street, along the march route from Judkins Park in the Central District to Seattle Center. Sales at Viet-Wah were 65 percent lower that day compared with the same Saturday before Lunar New Year a year ago. Sales the next day, which were roughly equal to that of a year ago, weren’t enough to offset Saturday’s loss either, she said. The march for women’s rights and in protest of President Trump drew an estimated 100,000 to 120,000 people. That day also happened to be the last Saturday before Lunar New Year, an important holiday in many Asian cultures, which falls on Jan. 28 this year. Many people shop on that last weekend, especially on Saturday, to prepare for the holiday’s festivities and gatherings. It’s akin to the Black Friday day of shopping that marks the beginning of the Christmas season, said Jamie Lee, program manager for the Seattle Chinatown International District (CID) Preservation and Development Authority. Restaurants in the CID tended to do well as people from the march stopped in to eat, she said. Grocery stores, though, saw a huge drop in sales. “Paying $10 for a bowl of noodles” doesn’t really offset “someone who patronizes Viet-Wah and does $500 of shopping for Lunar New Year,” she said. Uwajimaya, the big Asian grocery store located off the main march route, also saw the difference between sales of prepared foods and grocery items. Its deli exceeded last year’s Saturday before Lunar New Year sales by $4,000, said store director Alann Hamada. But sales at the store itself were down $25,000, more than 17 percent. The store did make up for some of those losses this week, but “it is quite the challenge as a business to want to support the march at the same time losing the funds you need to pay your people,” he said. The CID’s annual Lunar New Year Festival was moved from last weekend to this weekend because of the march, Hamada said. “Hopefully marchers will come back to the district to celebrate the new year,” he said.